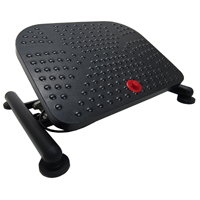 Designed with musicians in mind, the EZ-RYZE SOLO Foot Rest from ErgoVerse offers virtually effortless adjustment of height for optimal performance posture. Users can easily access the release button with their heel, engaging the gas spring to gently raise or lower the single-foot platform to any point between 4.3" and 12.6". The non-locking platform tilts freely between 0° and 30°, encouraging flexing of the feet and ankles during use. Arced ridges on the platform prevent the foot from slipping. The foot platform is formed from strong ABS Plastic. The sturdy frame and base of the EZ-RYZE SOLO are constructed of steel for stability and support. Large rubber feet on the base ensure secure positioning. Caution: Non-locking footrests, such as the EZ-RYZE SOLO described here, are not recommended for use in a standing position. Conçu pour répondre aux besoins des musiciens, le repose-pied EZ-RYZE SOLO de Mey Chair Systems supporte un seul pied et offre l`ajustement d'hauteur pratiquement sans effort pour faciliter une posture optimale durant la performance. L'utilisateur peut facilement avoir accès au bouton de relâche avec le talon, engageant le verin à gaz pour faire monter ou baisser tranquilement la plate-forme entre 4.3 po et 12.6 po haut. La plate-forme non verrouillée peut être inclinée librement entre 0° et 30°, pour encourager la flexion du pied et de la cheville. Des crêtes en arc sur la plate-forme empêchent le pied de glisser. La plate-forme du EZ-RYZE SOLO est fait avec le plastique solide ABS. Le cadre robuste est construit en acier, et la base est supportée par des pieds non-glissants en caoutchouc. Prudence: Les repose-pieds non verrouillées, comme le EZ-RYZE SOLO décrit ici, ne sont pas recommendés pour l`usage dans une position debout. 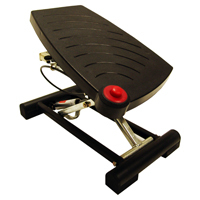 ESFR-13207 EZ-RYZE SOLO Foot Rest. The EZ-RYZE MATRIX Foot Rest from ErgoVerse offers virtually effortless adjustment while providing optimal support for the feet. Unlike comparable footrests, this robustly built model (and companion ARC and SOLO models) can easily be adjusted with a single foot. Users can access the release button with the heel, engaging the gas spring to gently raise or lower the platform to any point between 4.3" and 12.6" high. The non-locking platform tilts freely between 0° and 30°, encouraging flexing of the feet and ankles during use. A matrix of non-slip bumps on the 16.5" wide by 12.6" deep ABS plastic platform offers comfort and a massaging effect for the feet. The sturdy steel frame and base provide a wide stance for stability and support; the base is equipped with large rubber feet for secure positioning. The EZ-RYZE ARC Foot Rest from ErgoVerse offers virtually effortless height adjustment while providing optimal support for the feet. Unlike comparable footrests, this model (and companion MATRIX and SOLO models) can easily be adjusted with a single foot. Users can access the release button with the heel, engaging the gas spring to gently raise or lower the platform to any point between 4.3" and 12.6" high. The non-locking platform tilts freely between 0° and 30°, encouraging flexing of the feet and ankles during use. The arc-shaped, ABS plastic platform measures 21" wide by 14" deep and has non-slip ridges on the surface to ensure comfort and to provide a massaging effect for the feet. 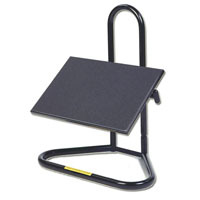 The sturdy steel frame and base feature a wide stance for stability and support. The base is equipped with large rubber feet for secure positioning. 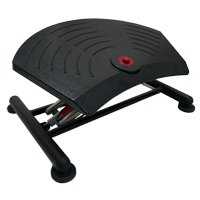 EAFR-13206 EZ-RYZE ARC Foot Rest.